CAPE TOWN, Jul 30 2016 (IPS) - Almost half a decade of drought across most of South Africa has led to small towns in crisis and food imports for the first time in over 20 years, as well as severely hampering the government’s planned land redistribution programme. It’s the cost of food in an economic downturn that has been the immediate effect. But hidden from view is a growing social crisis as farmers retrench their workforce and the new class of black commercial farmers has been rocked by the drought. Also hidden from many is the effect on small towns across the north of the country in particular, which are now reporting business closures, growing unemployment and social instability. According to emerging black farmers, the record high temperates and dry conditions of the last few years has led to an upsurge in bankruptcy cases and forced many off their newly redistributed farmland. While some have managed to take out loans to fund the capital-intensive commercial farming requirements, others aren’t so lucky. Even large-scale commercial farmers are now unable to service their debt. “It’s terrible, terrible, terrible,” said African Association of Farmers business development strategist, Thomas Pitso Sekhoto. BFAP farming systems analyst Divan van der Westhuizen says these farmers had already been struggling with increased costs and lower production. “The depreciation of the rand has a strong correlation on the landed price of fertiliser and oil-based products. Year-on-year there’s an increase of 11 percent on fertiliser and 10 percent on fuel,” he said. Agriculture development specialists say support for the sector has been limited. The largest agricultural organisation in South Africa, AgriSA, has reported that its office has been inundated with calls for drought relief assistance. Over 3,000 emerging farmers (most of whom are black) and nearly 13,000 commercial farmers have received drought assistance. “More and more highly productive and successful commercial farmers are struggling to make ends meet,” said CEO Omri van Zyl. “We appeal to government for assistance as these farmers have played a crucial role to produce food on a large scale. It’s especially farmers in parts of the Northern Cape, Free State and North West, Eastern Cape and Western Cape that face a severe crisis currently and who are in desperate need for financial assistance” he said. Government ploughed millions of dollars into a drought relief programme early in 2016. But the support dried up in February. Now Sekhoto said his farm is in the grip of what could be a terminal cycle. Business in small towns in the North West province and parts of the Free State are shuttering with reports that up 20 percent of all small businesses closed their doors in the first quarter of 2016. While farmers and businesses suffer, South Africa’s urban population has also felt the full effects of the drought. Some towns such as Vryheid in KwaZulu Natal province are using water tankers as their town dam dried up. Food prices have risen exponentially, said Grain SA senior economist Corne Louw. In Limpopo province, an Oxfam and Earthlife Africa community gardening project has found itself facing serious headwinds as the drought continues. Limpopo is one of the provinces that was most severely affected by drought, making it difficult for smallholder farmers to grow and harvest their crops. 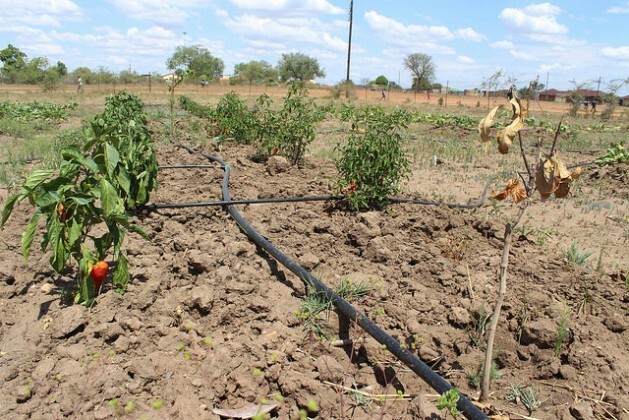 “Right now we get water from two boreholes, but it’s not enough to feed the school and the garden,” said Tracy Motshabi, a community gardener at Risenga Primary School, Giyani, Limpopo. “Because of the drought, our efforts in the gardens are not being seen because of the water scarcity. There is not enough water for irrigation,” said Nosipho Memeza, a Community Working Group (CWG) member at Founders Educare Preschool in Makhaza, Western Cape. Heavy rainfall was reported in late July 2016 across most of South Africa, but it’s come too late to save many of these small farmers. There may be some relief, however. Meteorologists at WeatherSA believe this year’s rainy season, which begins in December, could be wetter than normal. However, that may be too late for thousands of small farmers in the country.